**Names have been changed to protect the identity of this family. All quotes are mother’s exact words and it must be noted that her first language is not English. “I have a clean criminal record, I have no history of substance abuse of any kind, no rehab no nothing!! All I am guilty of is sometimes acting on fear my daughters time was running out. I want her out of there NOW!!! When I went to visit her, her skin stank, her stoma around her tracheotomy was bloody and dirty, she was in a tiny warm room with no fan or air conditioning, she is not allowed in a bath, she is not allowed to go out for walk, the staff don’t know a cough assist, which is terrible, as a cough assist is VITAL to her care, not knowing how to work this is unacceptable because if something happens and they don’t know, Emma could die!!!!! She has a cut on her neck after the nurses put a string on her skin with no sponge underneath resulting in this terrible cut!!!!! Sadly, Emma is just one out of a total of 10,000 children who have been taken into care in Great Britain since April 2011. Many of these children the Daily Mail (1) reported today, are part of the ever growing statistics in a worrying trend that is raising fears among professionals that large numbers of vulnerable children are being taken away from their families unnecessarily and left to languish in a care system that is failing them. So how did a severely vaccine damaged child become part of these appalling statistics? Life was not always this bad for Emma and she did not start out her life disabled; in fact she used to be a normal, cheeky little girl who enjoyed toddling around and playing with her toys. Sadly however, despite being born a normal baby Emma was constantly ill, suffering from a weakened immune system resulting in persistent infections requiring antibiotics for weeks on end. Ms X believes that Emma’s problems first began after she received her eight week routine vaccinations. Within hours of the vaccinations she became weak and feverish, refusing feeds. Worried, Ms X took Emma to the local hospital where doctors assured her that Emma had picked up a virus and would be fine. Not connecting the illness to the vaccinations, and blissfully unaware that this was only the beginning of her daughters problems, Ms X took her baby home. Emma’s real problems only became apparent after she received the MMR vaccination at 13 months. Up until this age Emma had been developing normally, she was beginning to walk, talk, was alert and was reaching all her developmental milestones. After the MMR however, Emma became very sick indeed after an extremely bad reaction. By this time Ms X was beginning to connect the dots and was waking up to the realization that it was the vaccinations that were causing her daughters problems. Sadly it was too late for little Emma. The damage was done. At 15 months Emma began to lose her balance and kept falling on her face. However, instead of putting her hands out to protect herself Emma just allowed herself to fall. Worried, Ms X took her daughter to see to a neurologist. He did standard tests which ALL came back normal. 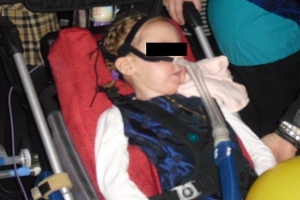 Emma slowly began to lose control of her arms and upper torso and by June 2008 at the tender age of two she was unable to breathe on her own and was taken to the PICU (Pediatric Intensive Care Unit). Beginning to realize that the vaccinations were the problem, Ms X’s instincts told her to not allow Emma to have any further vaccinations. However, as we all know, doctors can be extremely persuasive and when you are alone and frightened and needing to trust doctors with your child’s life, it is easy to believe what they are telling you. Sadly against Ms X’s better judgment Emma was given the flu vaccine and she immediately became much worse. Fearing the worst for Emma Ms X did everything possible to help her daughter. She traveled from one doctor to another to get help, advice and treatment. Each time the doctors explained to Ms X that Emma’s condition had been caused through VID or Vaccine Induced Disease. Ms X managed to get reports from four leading experts from around the world stating that Emma had been damaged by vaccinations. My diagnosis of Emma ———— d.o.b. ——-.2006 condition is on clinical grounds but supported by some investigation as being that of motor sensory polyneuropathy and involving the brain stem nerves as well as the pheripheral ones. This has been accepted by others before my involvement in this case and Emma —— was subsequently given treatment with immunoglobulins and steroids. To me most likely autoimmune response following vaccination. Suggestive diagnosis of some form of spinal muscular atrophy was never confirmed and later rejected. Currently the patient is totally paralyzed with control only over her eyes and eyelids. Today she is on 24hr assistance with BiPAP breathing. The patient was seen by various experts and her clinical condition does not fit any known classical neurological syndrome. However, careful anamnesis and the development of her symptoms following vaccination suggest a high probability that her current condition may be the consequence of vaccination induced damage syndrome (VIDS). In view of a lack of any better suggestion for diagnosis it appears to me that the option of VIDS is very likely the cause of her unusual condition. I enclose a copy of my report on Emma ——-. She is severely affected by what is most likely the result of motorsensory neuropathy following immunization. There is much weakness of the limbs and the body, but her brain stem nerves are also affected, and she requires direct gastric feeding and breathing assistance which is not sufficient for her now, and she requires tracheotomy as there is much swelling in her laryngeal region. Emma ——- I have been gratified to find that hospital and consulting physicians unanimously agreed that Emma —————-’ autoimmune illness was the result of routine childhood vaccines, with the MMR vaccine being the final agent of incapacitation. Despite all this evidence and with Emma so desperately ill and disabled the authorities decided that Emma was not vaccine damaged at all. In their report they say that she is suffering from ‘spinal muscular atrophy’ a condition that had already been disregarded as pointed out in the first experts report. In a bid to quieten one of the above experts who had became very vocal with his views and opinions on Emma’s condition, the authorities threatened him with the removal of his license if he did not keep quiet. Sadly this elderly and brave doctor died from a heart attack a short time later. Was his heart attack caused as a direct result of his treatment? Sadly that is a question that cannot be answered. The latest reports on Emma state that she is suffering from a genetic fault that inhibits her ability to process vitamin B2 and other vitamins from her diet so she has been put on a vitamin B2 treatment. This raises the question should Emma have been vaccinated in the first place? The authorities agree that Emma has been well cared for and that Ms X has a great understanding of her daughter’s problems however, they feel that she would not be able to care for the child on a full time basis.They say that Ms X is a wonderful and dedicated mother but the stress of looking after a child like Emma will become too much for her and have suggested that she has mental health problems. This is something that appears to be regularly suggested as a matter of course in the majority of cases where a vaccine injury has occurred. I have yet to come into contact with any family where this has not been used. As a consequence Ms X like many other parents has had to endure hours of psychiatric tests and assessments. Social services have said that Ms X neglected Emma, endangering her life by traveling to different experts around the world for assessments, answers and treatments not available in the UK. However, Ms X says that the treatment that she was able to get for Emma abroad actually saved her life and all she is guilty of is trying too hard to find a cure for her dying child. As a direct result of the accusations Ms X has been banned from photographing her child and is only allowed to visit her every 7-10 days with strict supervision. Charles Pragnell is an independent social care management consultant, a Child/Family Advocate, and an Expert Defense Witness – Child Protection, and has given evidence to courts in cases in England, Scotland, and New Zealand. Mr. Pragnell has over forty years of experience in working directly with children and young people as a social worker, a senior manager of social services, and Director of an independent organization providing services for children and families. What research is showing is that many hundreds of thousands of children and their families are being drawn into the Child Protection system for little or no reason, subjecting them to the fear-invoking processes of a child protection investigation and the accompanying stigma in their neighbourhood leading to their isolation. Many families report that such needless investigations have devastated and destroyed their lives and other research has shown that children suffer serious and long-lasting emotional harm from such investigations. They are seen as over-anxious and if they seek a second medical opinion, they are accused of `Doctor-shopping’. In the UK they are then called to a Child Protection Conference with all the assembled professionals usually after being subjected to an extremely invasive child protection investigation. They are not allowed representation although they are being accused of a criminal offence of neglecting their child and they are summarily found guilty merely on the opinions and suppositions of the professionals present, many of whom they have never met before. Professor Elizabeth Miller, Head of the Immunization Department in the UK who worked closely with Bob Chen at the CDC when the first Thimerosal studies were being “managed”, sat in the Joint Committee for Vaccination and Immunisation/Adverse Reactions Sub Committee, with Dr David Salisbury and none other than Professor Roy Meadow, of MBSP fame, when the MMR was being introduced. In the Sally Clark case, Professor Meadow accused her of killing two children who had just been vaccinated, one just 5 hours earlier. To my certain knowledge, as a Psychologist specialising in Autism since 1993, and working as a generic Psychologist since 1984, many parents whose children reacted to a vaccine have been wrongly accused of Munchausen Syndrome By Proxy (MSBP). Known side effects have been morphed into child abuse. Workers have been taught to view them this way and act accordingly. Some have had their children taken from them, some were sent to prison and Sally Clark lost her children and her life. Lisa Blakemore-Brown and Charles Pragnell are spot on; it appears that once a vaccine injury has occurred the government and medical profession do their utmost to cover this up to protect the vaccination schedules. What could be easier than blaming parents for the injury? The parents of vaccine injured children are being automatically blamed for neglect or child abuse taking the focus off of the vaccinations and transferring it directly onto the parents. This is what the UK laughingly calls ‘Child Protection’; I call it protecting the vaccine schedules and their bank balance.